Indian Creek Marina offers full or half-day rentals of Jon boats, 24 and 28-foot pontoons, tubes, for a fun and exciting day on Mark Twain Lake. If you have your own boat, keep it covered and secure with a rented slip, ranging in size from 20-52 feet. We’re also your destination for boat repair and maintenance! Come visit us today. Mark Twain Lake is your local destination for fun and relaxation, and Indian Creek Marina is here to make sure you’ve got everything you need to enjoy your time on the lake! 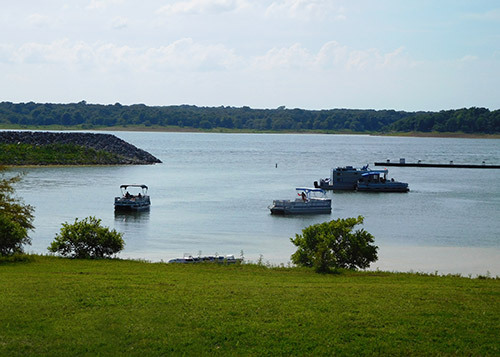 We’re your conveniently-located marina on Mark Twain Lake, offering boat and slip rentals, boat maintenance and wide variety of conveniences, including bait and tackle, food and more! Our marina is the place to start your adventure onto Mark Twain Lake, and we’ll do whatever we can to ensure you’re having the best time possible. Visit our on-site convenience store to stock up on snacks before you head out tubing, or grab a bite at our restaurant before spending the day in a Jon boat fishing for bass, crappie, bluegill or catfish!We’re pleased to offer a full fleet of boats just waiting for you to rent. Each boat rental on Mark Twain Lake is available for half- or full-day use, and all of our equipment is maintained to the fullest by certified boat mechanics. If you’re bringing your own boat, don’t forget to stop by and let us service it before you hit the water. No repair or routine maintenance procedure is too big or too small, and we always guarantee quality workmanship. We invite you to see why locals and people vacationing throughout the region make us a destination when boating season swings in! We’ve been serving area boaters since 1986! We’re proud members of the Mark Twain Lake and Monroe City Chambers of Commerce. We’re fully-certified to provide service for Mercury and MerCruiser brands. Our boat rentals are available for half- and full-day terms. We’re nestled in a quiet cove on Northeast Missouri’s beautiful Mark Twain Lake! Whether you’ve got your own vessel or you’re looking to launch one of ours, Indian Creek Marina is ready to help you enjoy a full-filled day out on Mark Twain Lake. January 5, 2018 Pam B. "Been here forever. Good to relax, friebdly people, beautiful." January 5, 2018 Katy W.
"Excellent Service! Chase was very professional and knowledgeable!" "Wonderful customer service, very friendly staff. We will definitely be back."